All living organisms in this universe are made up of cells. They either exist as a single cell or as a combination of multiple cells. 1. A cell is the structural and functional unit of all living organisms. 2. All the living organisms are made up of cells. 3. Cells are formed from pre-existing cells. 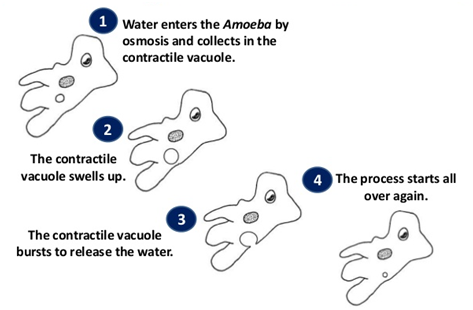 Unicellular Organisms – The organisms that consist of a single cell such as Amoeba. How can multicellular organisms originate from a single cell? A cell has the capability to divide itself into cells of its own type. Therefore, more cells can generate from an already existing cell. The shape of the cell may vary depending upon the type of function they perform in an organism. Cells are capable of changing their shape. For example, the white blood cells and amoeba can change shapes on their own. How can cells perform distinct functions in organisms? Cells are capable of performing multiple functions in an organism. 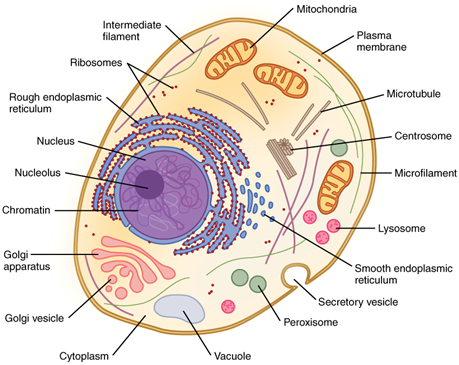 A cell contains specific components which are called Organelles. 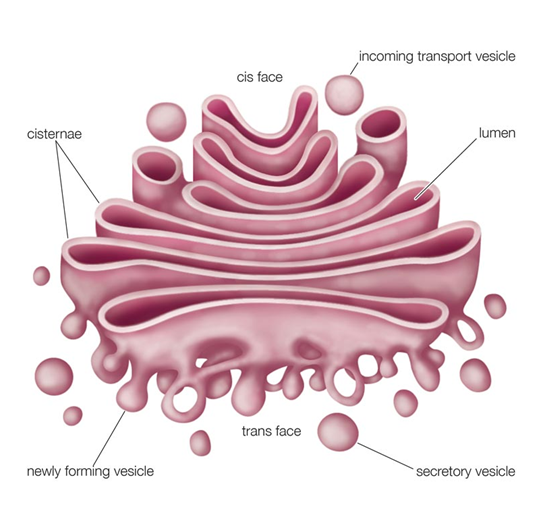 Each organelle in the cell can perform different functions such as making new cells or clearing the waste of the cell. Thus, organelles allow a cell to perform several kinds of activities in an organism. It is just like an envelope that covers the whole cell. Therefore, a cell gets separated from the external environment because it has a plasma membrane. The plasma membrane has the capability to decide which materials should enter or leave the cell and which should not. That is why it is also called as a ‘Selectively Permeable Membrane’. The Fluid Mosaic model explains the structure of the plasma membrane. According to it, the plasma membrane comprises of 3 components - Lipids, Proteins and Carbohydrates. These components can flow freely and fluidly inside the plasma membrane. Cholesterol - It is a lipid which provides fluidity to the surface of plasma membrane. The proteins act as receptors of the cell and help in transportation across the cell membrane. The carbohydrates attach themselves with the lipids and proteins and are found on extracellular side of the membrane. How can substances move in and out of a cell? Movement of Oxygen and Carbon dioxide to and from the cell is carried out by means of diffusion. Gaseous substances have a tendency to move to areas where their concentration is less from the areas where there is higher. This movement is defined as the process of diffusion. Diffusion can take place of solids, liquid, gases. It is carried out by the means of osmosis. Osmosis is a process in which water moves from the region of high concentration to one where its concentration is low through a semi permeable membrane. Therefore we can say that Osmosis is just a special case of the process of diffusion. 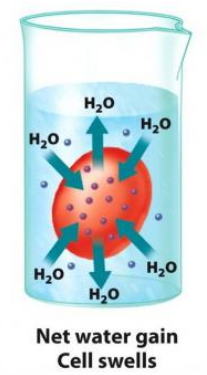 If the concentration of water outside the cell is higher than the concentration of water inside the cell the cell gains water by the process of osmosis. Water can move into the cell from the cell membrane. In the case of hypotonic solutions, more amount of water enters the cells which results in swelling of the cells. 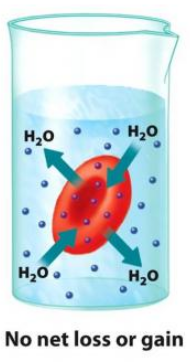 If the cells are put in an environment which has similar concentration of water as present inside. This state allows for the free movement of water across the membrane without changing concentration of solutes on either side. Therefore, the size of the cell does not vary in an isotonic solution because there is no net movement of water. 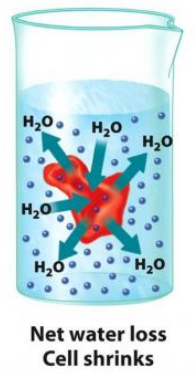 If the cells are kept in an environment which has lower concentration of water than what is present inside the cells then due to the process of osmosis water moves out of the cells. This results in a decrease in size of the cells (they shrink) as more amount of water comes out of the cell. It is a process by which the plasma membrane engulfs food and other materials inside the cell. The cell wall is a outer, hard covering of the cell which maintains the shape of the cell. The cell wall is generally made up of cellulose. Plasmolysis is a process in which the contents of the cell that are away from the cell wall shrink or contract when a cell loses water due to Osmosis when it is kept in hypertonic solution. Can dead cells absorb water? No, dead cells cannot absorb water through osmosis. How plants, fungi, and bacteria can exist in hypotonic medium? Plants, fungi, and bacteria exist in such situations because of their rigid cell membranes. Even if the cells swell up the cell membrane is able to prevent them from bursting out. 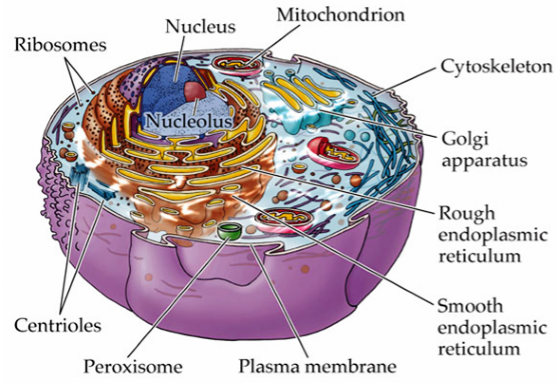 Nucleus is a prominent, organelle present in cell which is the controlling centre of all activities of cell. A nucleus has a nuclear membrane which covers it all around. 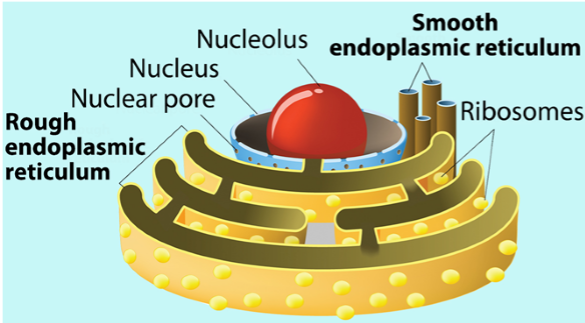 There are pores present on the nuclear membrane that allow movement of substances in and out of the nucleus. There are chromosomes, rod-shaped structures present in the nucleus which contain genetic information. 2. Proteins - These help in packaging and condensation of DNA. Chromatin is thread-like material present in a cell. 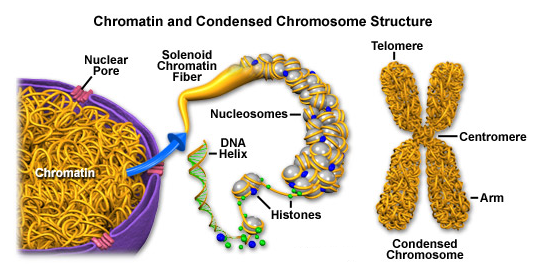 The chromatin organizes itself into chromosomes whenever the cell is about to divide. It is called as the Brain of the Nucleus. It comprises of 25% of the volume of the nucleus. It consists of proteins and ribonucleic acids (RNA). It helps in formation of ribosomes which help in formation of proteins inside the cell. Sometimes cells do not have a well-defined nucleus because they lack a nuclear membrane. Such a nucleus with no definite nuclear boundaries is called a Nucleoid. Organisms whose cells do not have a definite cell membrane are called Prokaryotes. Organisms whose cells contain a well-defined nuclear membrane are called Eukaryotes. Are there any further differences between prokaryotes and eukaryotes? The plasma membrane has a fluid like substance in it which is called the cytoplasm. It supports and suspends the cell organelles and molecules. The cellular processes occur in cytoplasm such as formation of proteins. It allows movement of substances in the cell such as hormones. In the case of Eukaryotic organisms, the cells contain organelles that have their own membranes apart from the overall cell membrane of the cell. What is the significance of membrane-bound organelles in a cell? The cells perform several functions. 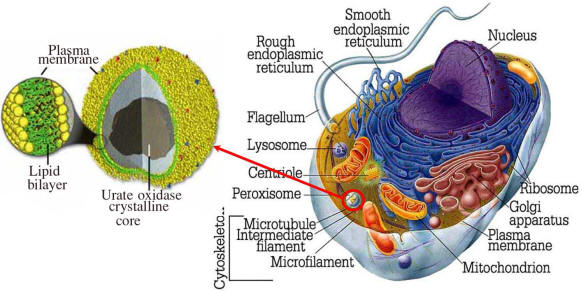 The organelles are useful because they allow separation of different functions that are being performed by the cell. The structure of the ER is quite similar to that of the plasma membrane. It is a network-like structure which consists of membrane-bound tubes and sheets. Rough ER contains ribosomes that are responsible for the manufacturing of proteins in the cells. They give a rough texture to the cell. The smooth ER manufactures fats or lipids in the cell which allow the functioning of the cell. What are the functions of lipids and proteins? Proteins and lipids synthesised on ER are used for making cell membrane. The process is known  as Membrane Biogenesis. Folding of proteins which are synthesised by ribosome on RER. Detoxifying poisons and drugs out of the cell is the function of SER. Camillo Golgi discovered the Golgi Apparatus. It contains vesicles that are arranged parallel in stacks. These stacks are called Cisterns. These vesicles have their own membranes. These membranes are sometimes connected to those of the ER. Golgi apparatus carries materials synthesized by the ER to different parts of the cell. The material is stored and packaged in vesicles. They are single membrane vesicles which are responsible for cleaning the cell. They can digest any foreign material such as food or bacteria and even the worn out cell organelles. How lysosomes can digest any foreign material that enters the cell? 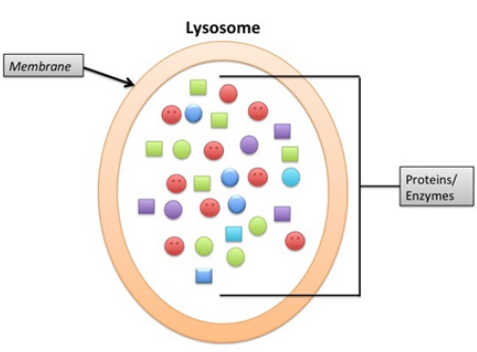 Lysosomes are capable of doing so because they have digestive enzymes in them. These enzymes break the materials and digest them. These enzymes are synthesized by RER and packaged into lysosome by Golgi bodies. Why lysosomes are called ‘suicide bags’? If the cell’s own material gets damaged or dead gets there are chances that lysosomes burst out, thus digesting its own cell. The cell requires energy in order to carry out several activities. This energy is generated by mitochondria which are often called as the ‘Powerhouse’ of the Cell. Mitochondria are site of cellular respiration. They use oxygen from air to oxidise the carbohydrates and thereby release energy. What are energy currencies of a cell? The Mitochondria generates ATP (Adenosine Triphosphate) which are energy giving molecules of the cell that are often called as their ‘Energy Currency’. 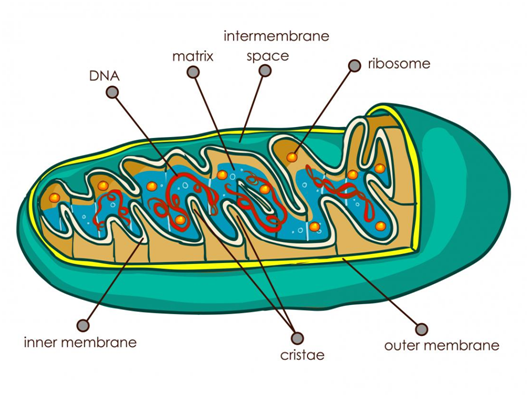 The Inner Membrane of Mitochondria called as Cristae Facilitates Generation of ATP molecules as it has a larger surface area. Just like mitochondria it is also double membraned organelle which has its own DNA and ribosome. Can further be divided into amyloplast, elaioplast and proteinoplast or aleuroplast. They are found in tubers, cotyledons and endosperm in plants. They are used to store starch. They are found in seeds and nuts. Chloroplasts are cell organelles that conduct photosynthesis in plants. 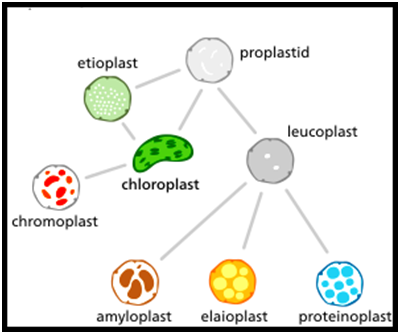 Chloroplast is derived from two Greek words Chloro and Plasts which means green and plants respectively. Chloroplasts contain photosynthetic pigments called ‘Chlorophyll’ along with lipids, carbohydrates, minerals, DNA, RNA, grana, thylakoids and stroma. Light-dependent Reactions in Photosynthesis – During photosynthesis chlorophyll absorbs the light energy which is then used to for two molecules ATP and NADPH. 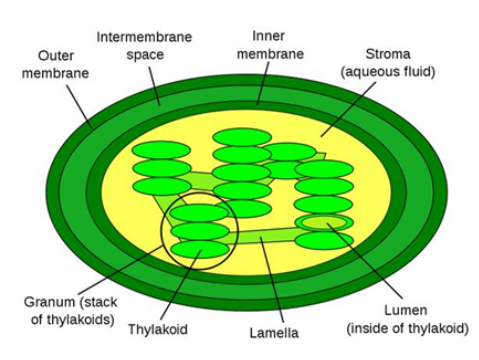 Thylakoids – They are pillow shaped compartments in the chloroplast. The light-dependent reactions in photosynthesis take place in the thylakoids. Stroma – It is a fluid-filled matrix in the chloroplasts. It is colorless fluid that contains all the enzymes that are needed for the light-dependent reactions in Photosynthesis. Grana – Stacks of thylakoids are called Grana. They are found in the stroma. They provide a large surface area so that the reactions of photosynthesis can take place. Vacuoles are the places where cells can store the liquids and solids. They are present in both plants and animals but the plant vacuoles are bigger in size than the animal vacuoles. These vacuoles are filled with a fluid called Vascular Sap. The fluid contains Amino Acids, Salt, Sugar, Proteins, Water, and Waste Materials. 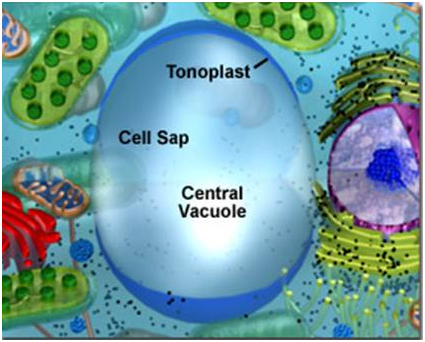 Sap vacuoles are separated from the cytoplasm by a semi-permeable membrane called Tonoplast. Their main function is to allow rapid exchange between cytoplasm and the surrounding environment. A number of sap vacuoles are found in young plant cells and animal cells. In mature plants the small sap vacuoles combine together to form a single large central vacuole. They are found in protistan and algal cells in fresh water. The membrane of the contractile vacuoles is highly extensible and collapses easily. These vacuoles are responsible for osmoregulation (maintaining the water content of the cells) and excretion in the cells. They are found in the cells of protozoans and several lower animals. Food vacuoles are responsible for digestion of food in the cells as they contain food enzymes. The digested food then passes into the cytoplasm. Found in single celled organisms like Amoeba. 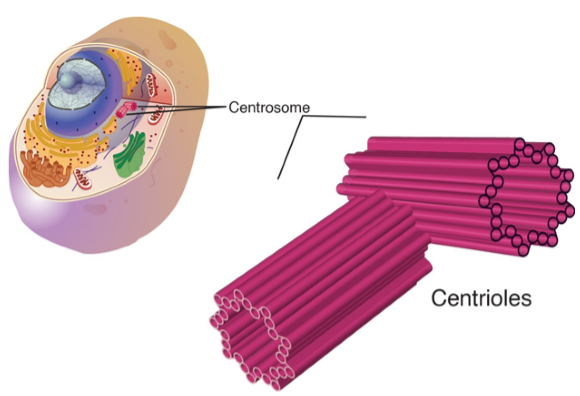 A centriole is a small set of microtubules arranged in a specific way. Their main purpose is to help a cell in cell division. They are found near the nucleus but they can be seen only during the cell division. They are found in pairs and form a special substance called Centrosome which appears near the nucleus. When the cell divides, the centrosome divides into two parts and each part moves to opposite sides of the cell. They are cell organelles responsible for protein synthesis. Ribosomes can be found in both prokaryotes and eukaryotes because the synthesis of proteins is important in both of them. In prokaryotes, the ribosomes float freely in the cytoplasm. In eukaryotes, they can be found floating in the cytoplasm or they are often attached to the endoplasmic reticulum. The ribosomes attached to the ER synthesize proteins that are to be exported out of the cell while the ribosomes floating inside the cell synthesize proteins that are used inside the cell. Peroxisomes are small vesicles found in the cells. These enzymes are used to break the toxic materials inside the cell. They digest the fatty acids of the cell as well as amino acids by carrying out oxidation reactions in the cell. They are also responsible for digestion of alcohol in the human body. Hence, the liver contains a large number of Peroxisomes.